Having mulled over the issue for the past couple of days, I’ve concluded that those collections of bad cover versions of pop songs performed by celebrities included in the Golden Throats series (4 volumes) are perhaps best understood as examples of travesty rather than burlesque. The difference between the terms resides in intentionality. A burlesque is any work purposefully designed “to ridicule a style, literary form, or subject matter either by treating the exalted in a trivial way or by discussing the trivial in exalted terms (that is, with mock dignity).” Burlesque is a form of derisive imitation achieved by exaggeration. In contrast, a travesty is any novel, play, poem, film, opera, or other creative work that reveals the incompetence of its author/performer. A travesty trivializes a serious subject or composition. “Generally, a travesty achieves its effect through broad humor and through incongruous or distorted language and situations.” Unlike a parody or burlesque, the purpose of which is intentional mockery, a travesty is any work in literature, music, or art that is “so poorly done” that it fails to meet “even the minimum standards” for style, technique, form, and so on. I used “perhaps” in the first sentence because we no longer adhere to notions of art’s autonomy—any formalist evaluation of the remarkable cover versions included in the Golden Throats series (I say remarkable because they’ve been collected and hence been “distinguished”) is bound to fail, as exemplified, for instance, in those art historians who tried to explain Duchamp’s Fountain (pictured) by appealing to the (traditional) aesthetic category of “beauty.” Duchamp was one of those artists who enabled the transfer from modernism to postmodernism—from art as “work” to art as “text.” Because it is impossible to list the properties of those works susceptible to Duchampian “remotivation” (what he did by placing a urinal in an art gallery), it’s no longer possible to refer comfortably to Golden Throats’ cover versions of rock and country songs as “camp.” In the 1964 essay “On Camp,” Susan Sontag argued, “not everything can be seen as Camp. It’s not all in the eye of the beholder” (Against Interpretation, p. 277). The trouble is, of course, it is. What sort of text (or event) cannot be radically re-read, that is, transformed into a travesty? 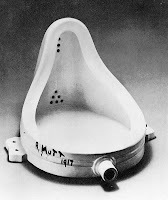 Think of Duchamp’s goateed version of the Mona Lisa, or Mel Brooks films such as The Producers or his remake of To Be Or Not To Be, which send-up Nazism.